McAfee ePolicy Orchestrator (McAfee ePO) is the most advanced, extensible, and scalable centralized security management software in the industry. Unifying security management through an open platform, McAfee ePO makes risk and compliance management simpler and more successful for organizations of all sizes. As the foundation of McAfee Security Management Platform, McAfee ePO enables customers to connect industry-leading security solutions to their enterprise infrastructure to increase visibility, gain efficiencies, and strengthen protection. Customers use McAfee ePO’s flexible automation capabilities to streamline workflows, dramatically reducing the cost and complexity of security and compliance administration. Security providers and system integrators can extend the reach of their offerings by incorporating their expertise and best practices with the McAfee ePO platform to deliver differentiated solutions. End-to-end visibility — Get a unified view of your security posture. Drillable, drag-and-drop dashboards provide security intelligence across endpoints, data, mobile, and networks for immediate insight and faster response times. Simplified security operations — Streamline workflows for proven efficiencies. Independent studies show McAfee ePO software helps organizations of every size streamline administrative tasks, ease audit fatigue, and reduce security management-related hardware costs. An open, extensible architecture — Leverage your existing IT infrastructure. McAfee ePO software connects management of both McAfee and third-party security solutions to your LDAP, IT operations, and configuration management tools. Unify the way you manage endpoints, networks, data, and compliance solutions with McAfee® ePolicy Orchestrator® (McAfee ePO™) software, the foundation of the McAfee Security Management solution. More than 30,000 customers use McAfee ePO software on more than 60 million nodes to manage security, streamline and automate compliance processes, and increase overall visibility across security management activities. With its scalable architecture, fast time to deployment, and optimization for enterprise systems, McAfee ePO software is the most advanced security management software available. Today, more than ever, IT organizations are taking a strategic approach to security—consolidating security portfolios to reduce complexity, investing in next-generation technologies to improve protection, and integrating with existing IT assets to streamline processes. McAfee ePO software enables tens of thousands of customers to centrally manage security, achieving dramatic efficiencies. Open framework unifies security management for systems, applications, networks, data, and compliance solutions. Extensible platform integrates with and leverages your existing IT infrastructure. Get the comprehensive views and insight you need, when you need it, to proactively address security issues—both internal and external. Shorten time from insight to response through actionable dashboards with advanced queries and reports. Identify unknown assets on your network and bring them under control with rogue system detection. Guided configuration, automated work stream, and predefined dashboards make getting started a snap. Tag-based policy assignment precisely targets assignment of predefined security profiles to systems based on their business role or at-risk status. Task catalog and automated management capabilities streamline administrative processes and reduce overhead. A single web interface aligns security processes for maximum visibility while a single agent reduces the risk of endpoint conflicts. Enterprise-class architecture supports hundreds of thousands of devices on a single server. Supports complex and heterogeneous IT environments. Enterprise reporting across premises and Security-as-a-Service (SaaS) security information. Ensure broad-based security and risk management solutions work together to reduce security gaps and complexity. Out-of-the-box, single agent deployment and customizable policy enforcement secure your environment quickly and keep it protected. Streamline security and compliance workflows with automations and a personalized workspace. The enterprise-class architecture of McAfee ePolicy Orchestrator (ePO) scales for organizations of all sizes, significantly reducing the number of servers to deploy. Protect your organization from today’s threats as well as tomorrow’s. Real-time threat intelligence from McAfee Labs proactively guards your infrastructure. The open platform facilitates rapid adoption of security innovations as new threat categories emerge. With McAfee ePO software, IT administrators can unify security management across endpoints, networks, data, and compliance solutions from McAfee and third-party solutions. McAfee ePO software provides flexible, automated management capabilities so you identify, manage, and respond to security issues and threats. You define how McAfee ePO software should direct alerts and security responses based on the type and criticality of security events in your environment, as well as create automated workflows between your security and IT operations systems to quickly remediate outstanding issues. As a result, you save time and money—with a more effective security program. McAfee ePO software helps drive down the cost and complexity of managing security. With existing security management toolsets, complex infrastructures with hundreds of servers, and thousands of endpoints, you can’t afford to wait hours or days to collect endpoint data and then days or weeks more to remediate through traditional policy enforcement tools. Real Time for McAfee ePolicy Orchestrator (McAfee ePO) is the first and only solution that allows enterprises to query assets in seconds, identify potential issues, and mitigate risk in seconds rather than days. This groundbreaking technology dramatically reduces exposure risk and cost of security events, outages, breach potential, and damage to reputation. Real Time for McAfee ePO is the first security control system that lets you instantly find any information about any computer, deploy products, or update configurations in the environment in a matter of seconds. In large or complex environments, this is literally hundreds to thousands of times faster than traditional solutions. Instant information on the state of computing assets in seconds, not hours or days. Increased protection through policy enforcement to ensure that antivirus, encryption, and other crucial services are always installed, running, and up to date. Cross-referenced threat information with a large, continuously monitored peer-to-peer network. Acceleration to antivirus, data loss protection, host-based intrusion prevention, whitelisting, web filtering, firewall, encryption, and other security products offering increasing scalability and reduced management timeframes. Real Time for McAfee ePO Responds to security queries up to 1,000 times faster. Enhanced disaster recovery Recover your McAfee ePO server and settings quickly and efficiently. Native 64-bit support with reporting orientation Improved performance. Policy comparison, common task orientation Improved usability and navigation. Enterprise mobility management Manage your mobile devices within McAfee ePO software. Single page deployment Simplified workflow and ease of implementation. URL installation of endpoint products Easy remote endpoint installation. HTML5 UI support Now supports the latest browsers, including IE8+, Firefox, and Safari 6. New language support Support for nine additional languages. Automatic product download For new customers installing McAfee ePO software for the first time, available products will be downloaded automatically, saving time. “Getting Started with McAfee ePO software” “Getting Started” improvements simplify and streamline the initial McAfee ePO software installation and product deployment workflow, making it easy to deploy protection via default policies. Workflow improvement Tag grouping allows administrators to organize tags into logical groups and improve categorization usability. FIPS-certifiable code When installed in FIPS mode, McAfee ePO software 5.1 leverages FIPS-compliant RSA libraries. 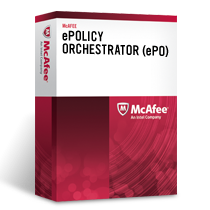 Download the McAfee ePolicy Orchestrator Datasheet (PDF).